eD@HoMe: My first cover from Lithuania! Here is my first cover from Lithuania. Thank you Anna! 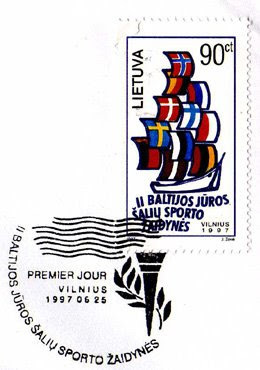 It is actually a FDC from “The second sport games of Baltic sea countries” series, issued on 25th June 1997. The stamp franked on the right of this cover shows the flags of the participating countries. 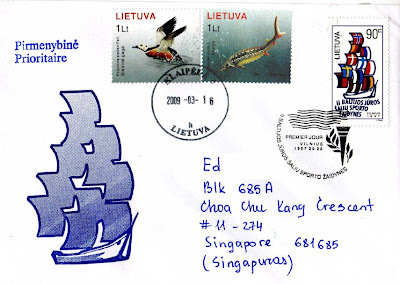 The other 2 stamps are from “The Red Book of Lithuania, Sea Fauna” series, issued on 16th September 2006. It is a continuous series of postage stamps devoted to the Red Book of Lithuania to picture the vanishing species of plants and animals. 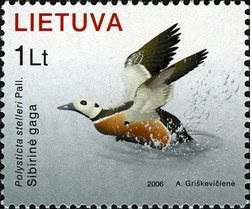 The first stamp on the left pictures a STELLER’S EIDER (Polysticta stelleri Pall.). It is a bird of the sea duck species, which is the rarest in the world. Environmentally it is the most important water bird species that winters near the coast in Lithuania. During the period of incubation Steller’s eiders live in the near-shore zone in small tundra lakes. The rest of the time they spend in the sea.In Lithuania these birds are watched near Palanga and Giruliai in winter. Since 1997, the number of the Steller’s eiders wintering here has been decreasing. 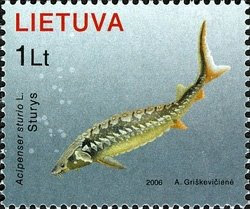 The second stamps depicts a BALTIC STURGEON (Acipenser sturio L.). It belongs to the Sturgeon family.It is a passer-by fish which lives in the Baltic Sea. Formerly it would go to the River Nemunas and its tributaries for spawning and then would return back to the sea.In 19th century the Baltic Sturgeon was not a rare fish in the Baltic Sea Basin. However, it has been caught neither in the Nemunas nor in the Curonian Lagoon for the last 30 years. 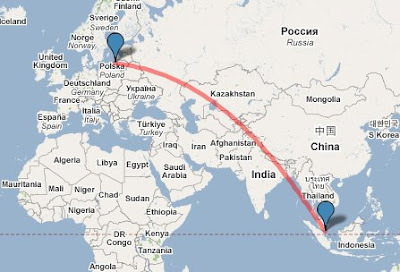 This cover was postmarked on 16th March 2009, traveled an estimated distance of 9,425km and took 10 days to reach me.